An unusual day to be leaving home at 0330 for a very quiet journey by car to Stansted arriving at 0640 after a detour to Birchanger services. These were not quite closed and rather amusingly wanted 70p per litre for petrol, compared with a current price of 61p in Wolverhampton and Telford [how times change. In November 2005 it’s 92p and has been, and no doubt will be, higher. (Yes, in 2018 it's 120p...)]. Duly checked in for Lufthansa (by Servisair, on a Scandinavian Airlines ticket). I went in search of breakfast phase II, to find Bewleys in the landside area does a very good b/e/s/t/tea for £3.25. [Alas, not there now. A retrograde step]. Two further attempts to contact Orange to see if my phone was still enabled for roaming were futile – over an hour listening to their tacky music including two attempts en route (one lasting from Telford to Great Barr). Minor (fortunately) drama as I was waiting for the peoplemover, as airport staff started talking on their radios about ‘full emergency’ and ‘hydraulic pump failure’. Fortunately the aircraft, an Air UK F100, landed safely and taxied in very slowly, pursued by two fire engines and slowing to walking pace to turn. The extent of the failure wasn’t obvious to a non-expert, but all seemed well. The admirable Lufthansa departed on time, informed us that we would fly lower than usual to avoid turbulence, would be helped by the wind and arrive 20 minutes early. And so it was; I just made the 1116 S-Bahn off a supposedly 1115 arrival, after an excellent breakfast (phase III), all helping to make LH look much superior to BA.. The S-Bahn went by the new branch opened six weeks ago and arriving in München from the west. There’s a flying junction where the airport branch joins the main line from Landshut… 70 minutes to kill at M-Hbf, so off to the Augustiner Bierhalle (10 minutes walk) for a restorative weissbier. 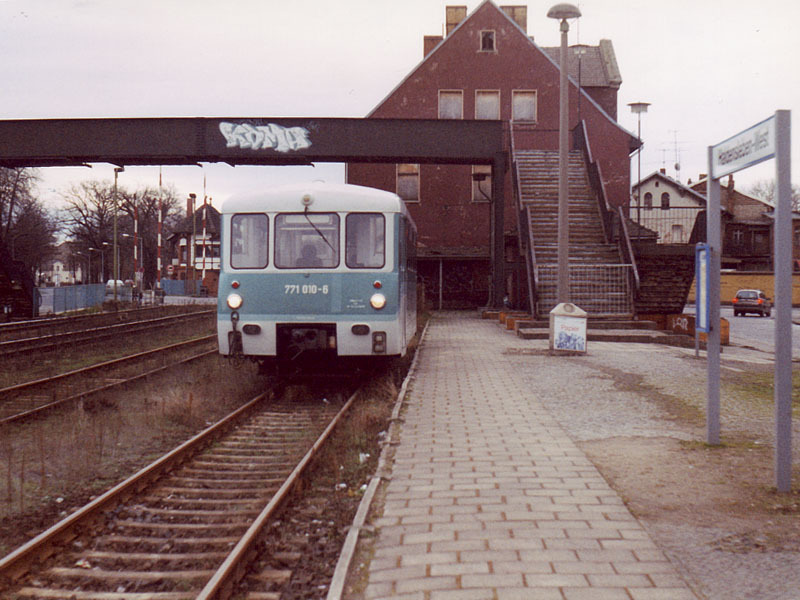 Back then to Hbf for 1315 ICE to Fulda. This being a travel memoir I shall record only the announcement of my daughter’s engagement, received by phone between Augsburg and Würzburg, and the punctual arrival at Fulda! Onward connection was by EC, in the dark, to Leipzig which was reached 35 seconds late. Disgraceful. Accommodation was secured at the nearby Ibis at their DM90 standby rate, a sandwich and a can of Franziskaner Weissbier (sedimented? In a can? Nice though) obtained, messages left for all and sundry, and off to bed at 2030 anticipating an 0515 alarm. Leipzig was still partying when I left the hotel at 0535. Quite a brave effort, but at least it’s very mild, and dry. The Man said to get my ticket on der Zug as the booking office was closed until 0600, but this being Germany they can actually start work when they arrive, and a Wochenendticket was purchased at 0553. A narrow shouldered double deck set formed 0605 to Halle. These things are quite seriously uncomfortable, especially upstairs! A 4 minute booked, cross platform connection provided no problems at Halle. A similar set formed 0643 to Magdeburg but I travelled in slightly greater comfort in the ‘mid level’ compartment at the end. The difficulty of seeing where you are when it’s dark outside is considerable, with tinted windows and daylight-level lighting inside. I managed to decamp successfully at Schönebeck (Elbe) to do the 0806 to Blumenberg which turned out to be a Ferkeltaxi. An altogether satisfactory branch – daylight by now – single track all the way with a good climb at the end to Blumenberg. I changed my plans here – original intention was to go straight back to Magdeburg but I decided to do 0904 to Stassfurt, also a closure and another 771. A third one was waiting, bound for Eilsleben and the fourth connecting train (UK please note) was a 219 propelled 2 car set for Magdeburg. The cunning (and useful) change of platform from 3 to 5 failed to deceive me! Very hasty replanning had me on the 1049 to Haldersleben behind 218 111. Study of the timetable (3 mins connection for Eilsleben, 8 for Weferlingen) prepared me for the long walk to Haldersleben West where another 771 was waiting. It’s actually about 5 minutes at a reasonably brisk pace. The branch runs parallel to, but at a discreet distance from, the main line, closes up for a bridge then diverges into some quite picturesque country with a couple of freight branches. Condition of track appears dire, especially around km 6. 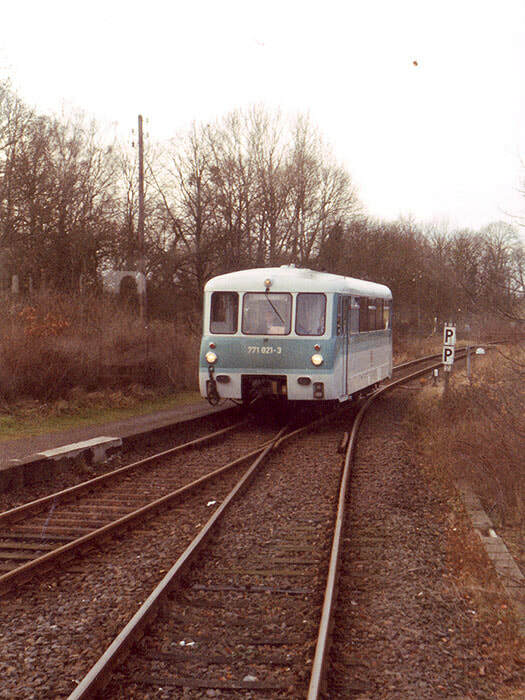 The incoming train is crossed at Altenhausen where the outgoing one reversed into the loop to wait, then back into the platform for reasons not wholly clear (possibly to do with a passenger getting off for a ‘fag break’). Several more very iffy stretches of track before Weferlingen Zuckerfabrik where the sidings contained a surprising collection of DR liveried stock, including a double deck set, and two more Kriegs, one with its chimney covered over. Presumably this is a preservation site. Another branch [from W-Zementwerk] trails in left [as does the former line from Helmstedt severed during the pre-reunification era] before Weferlingen ‘Hbf’ which has a number of sidings. Although now a terminus, the line appears to have continued. [It did, to Oebisfelde.] The station pub was functioning, but the 5 minute turn round was insufficient. Shame, but altogether this was a far more worthwhile branch than it appeared at first. [Not least because it’s closed since!] 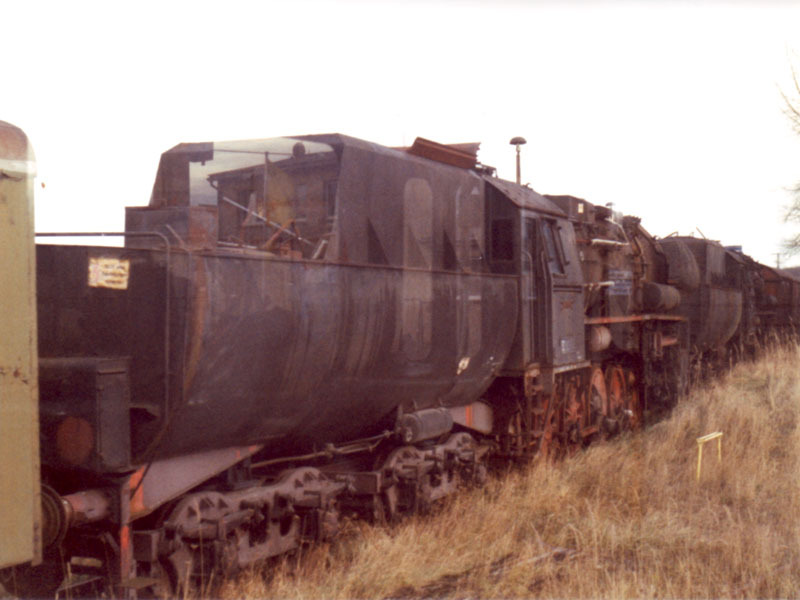 The two kettles turned out to be 52 8028 and 52 8156 – there was also a 301 and a small shunter among the collection. Breakfast was finally achieved on the return to Haldersleben (KitKat and 7-Up from a machine – pubs and shops all shut at 1425). 1502 to Eilsleben was 2 x 772. Two passengers as far as Hundisburg, the first station, then just me. The line is unexceptional – long straight stretches and lightly engineered, though as a result it has to wind over a ridge near Eilsleben. At Eilsleben, unfortunately, it runs into a bay, albeit one which looks as if it used to be a through line. Only two other passengers for the 1601 to Magdeburg but literally hundreds already on it (it was a 3 car double deck set). Seemingly many were students going on to Berlin, and presumably travelling on REs to use Wochenendtickets. I could only just wedge myself and bag inside the door and put up with it until Magdeburg. A 37 minute connection gave time to go outside to look for hotels (there aren’t any nearby except the InterCity). Just outside the station is a McDonalds – as I’d had only a small ham roll and a KitKat since 10 a.m. yesterday, the lure was too strong and intentions of a proper meal in Leipzig vanished. Still, it filled the gap for just over £3. 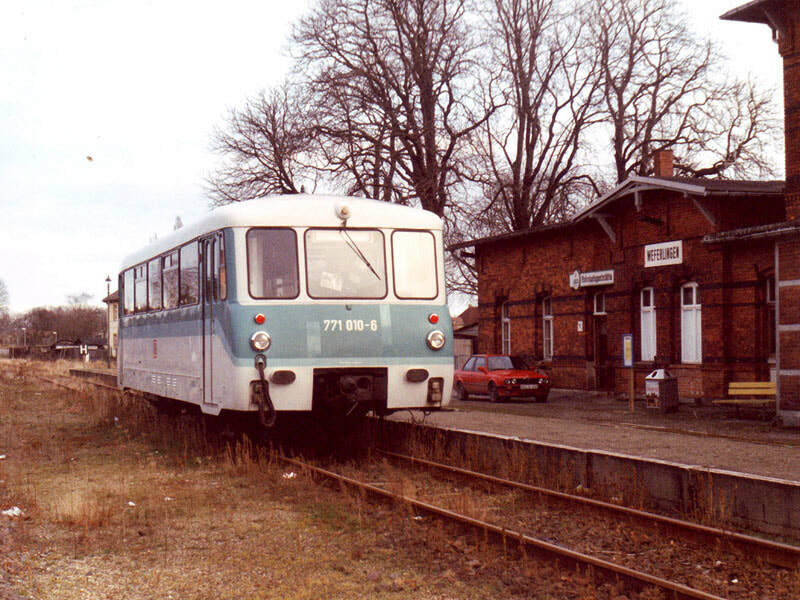 Return to Leipzig was on 1706 via Dessau and Bitterfeld – in the dark and not new track so of no consequence. At Leipzig the sole benefit of winter gricing became apparent – you get seriously early nights! Bank Holiday in England but a hive of activity in Leipzig as I left at 0540 to catch 0556 IC to Köln, as far as Halle. This rolled into Halle on time, alongside a connecting IC to Hamburg. 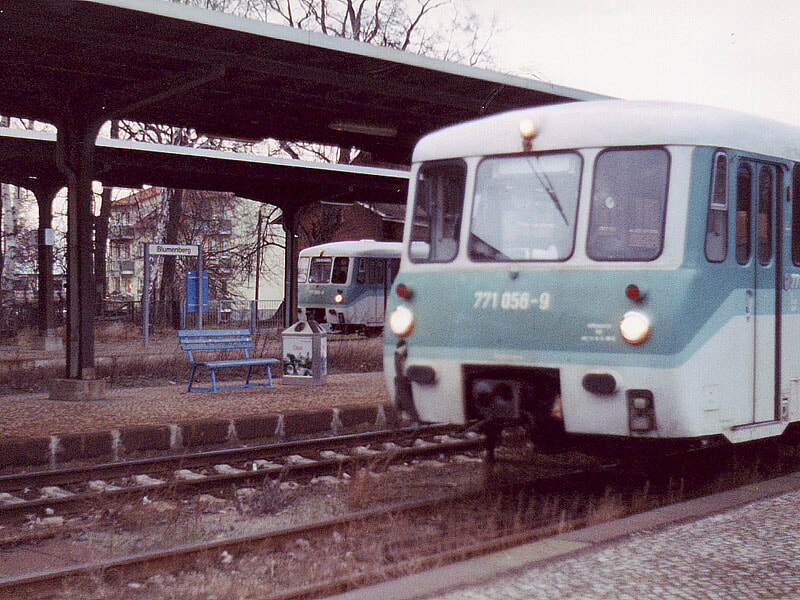 The 0642 to Röblingen am See and Sangershausen, 143 propelled, was waiting and took a handful of passengers to Röblingen. The Querfurt platform was empty but a steam heat diesel was brewing up in the yard. 202 558 then arrived from Querfurt but disappeared instantly, the 0725 to Querfurt turning out to be 202 303 which was the one from the yard. A cheery lady conductor took one look at my EuroDomino, clearly didn’t know what it was and wished me well. 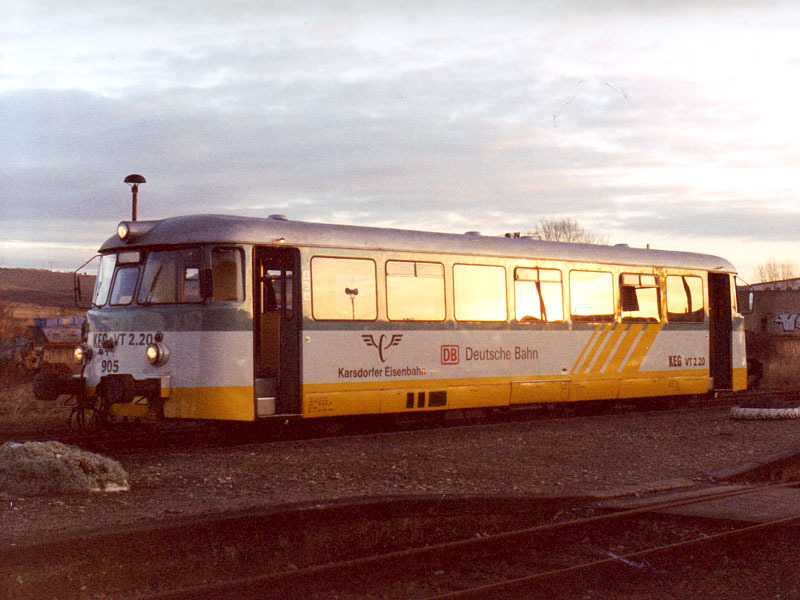 Dawn broke en route to Querfurt and to my great relief there was a Karsdorfer Eisenbahn railbus waiting. Enquiry elicited that it was going to Vitzenburg, and it set off on time. This was an older railbus which appeared to have a dog clutch and ‘sat down’ with a loud bang when it started. The line proved to be another worthwhile one, basically a long climb then a long descent through downland/Chiltern type surroundings. Basic railway, all single though there is one branch off westwards near Querfurt. At Vitzenburg (looks a real dump but then again the station is out of town a bit) the ‘main line’ appeared almost disused but closer inspection revealed that all was well (fortunately, there being no other way of getting to München!) 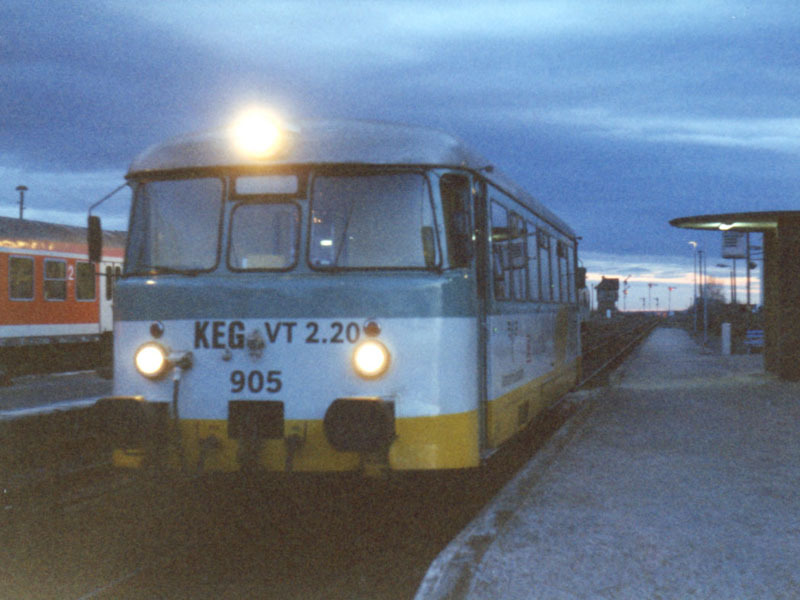 and the appearance of another KEG railbus explained the light wear on the rails. At Karsdorf, the next station, there is a cement works and some flats and possibly some other things, but definitely a cement works, rail connected. Although otherwise conscientious, the gripper decided not to bother with me thus avoiding any interchange of views regarding the validity of EuroDominos. At Naumburg there is ex metre gauge tram track outside the station but no sign of a current system. [It’s not far away but inexplicably doesn’t serve the station as I discovered on a later visit.] The IC to München appeared on time and was sufficiently full to make my seat reservation a Good Thing. It became more wedged as the journey progressed. A very impressive climb is made south of Jena, presumably over the Elbe/Danube watershed. The descent is more gradual. At Nürnberg there is a DB museum (the DB museum?) but not a lot to be seen from the train. Augsburg was reached more or less on time but a long stretch of engineering works caused a late start plus loss of time. Due to the confusing layout at München Hbf I decided to bale out at M-Pasing where it ought to be easier to find the S-Bahn for the airport. Wrong. There were no timetables and very little signposting of any use. [On a visit to Pasing in 2005 I found the train information impeccable as usual.] The train was found with assistance from its driver (fluent English, just like all Central Trains drivers speak fluent German – no, perhaps not then) and the airport reached 65 minutes before departure. I'd already planned a winter closure bash and made use of the same Eurodomino for my next trip to Germany in mid-January.